Please IGNORE my previous post about the minimarathon in Indy. I can NOT do it. Well, if you already signed up, then I will do it. But Melvin is going to be in San Diego that weekend...so I'd actually like to go with him. And I'll have to arrange some sort of childcare. It's been a couple weeks since the marathon, and I'm still losing toenails! Yesterday my big toenail came off. I'll spare you any photos! And I must admit that I haven't even run a block since the marathon day. I'm so bad like that! Of course the cold weather, load of school work and general mom stuff are providing excuses for my lack of action. Today I signed up for the Indianapolis 500 mini-marathon on May 5th! It's over 72% full, so you gotta sign up now! It also has a walking division. I registered with a time of 2:10...and plan on mailing in confirmation for a preferred coral (it explains it in the registration). Let me know if you sign up, and I'll see about hotels. Can't wait to hear how it all went! Someone post soon please! Read a bit on Cari's blog but not enough- and where is the picture of the necklace?? The half-marathon with strollers went okay. It was an overall fun experience but my neighbor suffered an injury en route so took away from the fun. Fortunately she is feeling much better now and we're hoping it was more of a minor injury than it seemed at the time! She ended up with a troublesome knee injury the last two miles so we had to walk it in. (Well, I walked and she limped. At least the stroller made a nice crutch.) Little guy did well- slept most of the way and when he did wake up, cooed on the downhills. (I felt like cooing too- the uphills were hard for me and the break on the downhills much needed.) He did have some tears near the end but they were short-lived. We had lots of cheers and comments- the race was @ 70% women so I felt a bit like I was out in San Fran with you all! Probably my favorite part of the whole experience was driving my car to the start, passing by all the buses, with the "official race vehicle" pass they gave us on my dashboard. It was really nice to sit and nurse in a warm car while watching all the other runners huddle in the cold desert waiting for the start. We stepped out just minutes before starting, toasty warm with cozy little ones. Less than a week away!!! ARE YOU READY????????? Sunny, High 66°FLow 56°F -- Could it get more perfect than that??? Drink lots of water, eat lots of pasta, get plenty of rest! Here's a link to the cards Lanette and I used to help us finish our long run in the Outer Banks. They really helped take my mind off how incredibly horrible I felt. And boy did we spark some conversations!!!! I ran my last long run yesterday. I know, I know....I'm supposed to be tapering. But after my crappy run in the heat of the Outer Banks, I needed to do another long run just to give myself the confidence I needed for this marathon in a couple weeks. I was supposed to run long on Monday...but it was 83 degrees. Yesterday it was around 60....perfect! I just set out to do 3 1/2 hours. I ended up running around the perimeter of my town. And the last hour involved long country roads...which translates to long country uphills!!!! I can't believe I finished a run like that slogging up hills! But it felt good to be able to run that far without too much trouble. My body was certainly aching that last hour...and to think in the marathon I'd have another hour to run...oh my! So I know I probably shouldn't have, but I did it....3 1/2 hours. I just hope I didn't over do it! I don't know about Cari, but our trip to the Outer Banks seemed like the shortest trip we have ever taken. The time seemed to fly by! We stayed at a great hotel, slept in, ate what and when we wanted, went shopping, and had some fab martinis! I didn't have the greatest run (we seem to alternate on these long run trips, so I guess it's Cari's turn next time to have a bad run), but I didn't turn back and though I walked/ran half of it, I still ran for 3:20 and Cari did 3:30+. 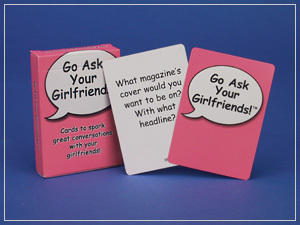 I would recommend getting Girlfriend question cards - ask Cari where she got them. They really helped in getting us through those last five miles. And the conversation those questions generated! We have to have them for the marathon! After the run and a bit of time spent on beach and by the pool (it was very hot, over 85), we did a little shopping for kid's gifts and wine, had a great dinner in tropical storm force winds, and then capped the evening off by hitting a couple of martini bars and talking to strange women about breast implants! All in all it was a relaxing weekend - I forgot all about the dissertation I am trying to finish and my crazy job! I can't wait until San Francisco - we can fill you in on the details then! I will be more than virtually joining you in your Tiffany-necklace quest on the 22nd! About the time you all are pounding up the hills in San Fran looking for chocolate, I'll be pushing my running stroller in Little Guy's first ever half-marathon. My next-door neighbor and I have committed to running "The Other Half" half-marathon in Moab, UT (home to Arches and Canyonlands National Parks) and received permission to run with our strollers and infants. Needless to say, Husband thinks it's crazy to run a half-marathon pushing a stroller. I'm not sure that I totally disagree with him- as I've explained before here (I think) I just can't seem to figure out how to run with the thing without tripping or dying of exhaustion on any sort of uphill grade at all. However, running with my Little Guy and a single stroller seemed a perfect solution to my neighbor's original idea. She thought we'd take a girls' weekend of sorts to run the race- heading out to Moab with just the kids, meaning my little one, her adorable little baby girl, and her equally adorable 4 year old twins. Sounds fun until I realized the next part of her plan: We would each push a double stroller with 1 FOUR-YEAR-OLD twin and 1 baby. Remember again my earlier statement: I just can't seem to figure out how to run with a SINGLE stroller and little 5 month old infant without tripping or dying of exhaustion on an uphill. There is no doubt in my mind that the unlucky twin that ended up with me would be busy flagging down the sweep vehicle and EMTs after I had dropped to the ground somewhere in the first few miles. My neighbor didn't quite comprehend my vision and thought we'd be fine. (Mind you, the woman is an amazing athlete and pushes a double running stroller like it's floating on air.) Luckily, we have convinced her mother to run the half as well, so now have a grandfather available to watch the twins and Husband is coming along too, so I'm off the hook and down to just pushing 1 child along. I'm very much looking forward to the run- I can't quite call it a race as it will have to be very non-competitive. My neighbor and I rarely get the time we want to chat so it will be terrific to have a few hours on the road to do so. Only issue is that I will be huffing and puffing with that running stroller so she'll have to do the talking as she effortlessly runs along and I gasp in response. (There's also the "side" issue of what happens if Little Guy decides not to take a nice stroller nap like normal...) The course is beautiful with the red rocks and views. (Tons of movies and commercials are shot in Moab so you've actually "seen" the place before!) We're promised hot chocolate at the beginning of the race and beer at the end- very nice. Won't quite live up to my dreams of a chocolate mile and a Tiffany necklace, but it'll do for now, and it will be fun thinking of you all out running at the same time just one time zone away.